Why is iWood's Timber on the TV? How did Huntley Wood use iWood's One Square Edge, One Waney Edge Cladding? iWood Celebrates Best Month Ever – Is the Industry ‘On the Mend'? What's Next for iWood's New Website? What's New at White Castle in Wales? 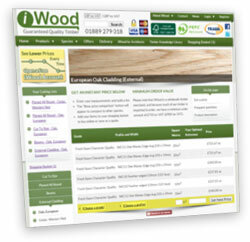 How Can You “Trick” the iWood Website into Giving Better Prices? iWood's Timber on the TV! Thursday evenings, 8pm on Channel 4 is George Clarke's Amazing Spaces. Throughout the series, various timbers are used that have been supplied by iWood, including Douglas Fir Beams. Fame at last! Again in 2012, iWood supplied One Square Edge, One Waney Edge Oak Cladding to Huntley Wood, a privately owned Outdoor Events venue in Cheadle, Staffordshire. The cladding was used on the exterior of their new custom guest cabins, nestled in the woodlands of the 170 acre site. We are pleased to announce that October 2013 was the best month for sales that iWood has experienced in the four years we've been trading! Not only were more people ordering, but on average our regulars ordered noticeably more than usual, an indication of business improving across the industry. We'd like to take this opportunity to thank everyone that uses iWood and look forward to working with you again. The single most popular request on our new website is the ability to edit items in your cutting list once they've been added, rather than having to delete the incorrect one and add it again. This is our top website development priority and is due to be rolled out to all products in early December. This feature wasn't included in the new website at launch because we were conscious that if we added everything we wanted to begin with, the new site still wouldn't have been launched! Aside from opening a free iWood account to instantly give you better pricing, there's one ‘trick' to getting better prices which at first seems counter-intuitive. Many people ask for quotes on long lengths with a view to cutting it down themselves. The logic behind this thinking is that the less machining iWood has to do, the lower the price. In fact the opposite is true. The big, tall trees that the longer lengths come from are rarer and therefore cost more, especially when trying to find a long length without knots for Prime Grade. The answer then, to achieve the best pricing, is to always specify the exact lengths you need rather than planning on cutting them down yourself.